If you’re building a new home, remodeling your existing home, or undertaking an addition, this is the perfect time to consider putting today’s state-of-the-art electronics to work for you. New electronics will make your personal lifestyle easier, more convenient and far more enjoyable. At Audio Innovations, we have the experience and expertise required to accomplish these goals. But we have something more: the ability to show you all the possibilities and help you choose the custom-designed system that best meets your needs and budget. Most of the time, the conversation begins with the design of a home theater system that combines sophisticated audio and video applications to take home entertainment to a new level. 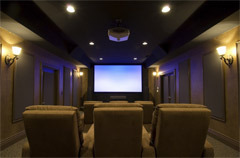 By combining video displays such as a plasma televisions or even 150” movie screens with high quality speakers, amplifiers and sound absorbent materials, we create a theater environment that will be comfortable for you and your family. But that’s really just the beginning. We’re experts when it comes to creating comprehensive infrastructures and integrated control systems that bring together all of your home electronics into one easy to use system. Imagine having your home lighting, entertainment, security and climate systems combined into one ultra-responsive system that you can program in advance, control with the touch of a button or even a phone call. Whether that strikes you as a bit over-the-top or just your style, Audio Innovations can make it happen. We can help you imagine the system that meets your needs, design and install it, then show you how to get the most out of it.